Evergreen tree; grows to 90 feet tall. Leaves, smooth, leathery; with few to many spine-tipped teeth. The dark green leaves are alternate, elliptical, and spiny. White flowers grow in axillary clusters, those on the female plants developing into scarlet, berry-like drupes that remain through the winter. Flowering time from May to June. Flowers are followed by clusters of round red berries in midwinter. Fruits red or orange (rarely yellow); Bark is smooth and grayish-brown. Sprigs are familiar Christmas decoration. Berries are poisonous, will induce violent vomiting. Other varieties: Mountain holly (Ilex aquifolium) also called English holly or European holly; Indian black drink (Ilex vomitoria) also called black drink plant, emetic holly, and yaupon holly; Winterberry (Ilex verticillata) also called black-alder, brook alder, false alder, feverbush, and striped alder; Yerba Mate` (Ilex paraguariensis ) also called Mate`, Paraguay tea, and Yerba. 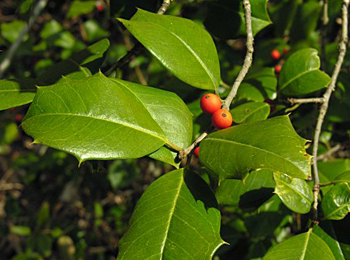 White holly is a native North American evergreen tree or shrub found along the Atlantic coast. Mixed woods. Eastern Massachusetts to Florida; Texas, Oklahoma to Illinois. Diuretic, purgative, astringent, expectorant, reduces fever. The powers of evil hated the yew and found the holly equally obnoxious, the reason being that the yew was generally found growing in churchyards and the word “holly” is similar in sound to the word “holy”. To the early Christians, however, the thorny foliage and flaming red berries of the holly represented the crown of thorns with drops of blood falling to the ground. They claimed this to be the true reason the herb was magically protective when brought into the home, shielding mortals from evil spirits that wandered over the land during bleak winter months. Pliny said that the branches of the holly tree defend the house from lightning, and men from witchcraft. According to other legends, holly blessed the home with prosperity and good fortune provided the plant was not removed from the Christmas decorations until the New Year, and in some countries it was never disturbed until Candlemas Day (February 2). The Chinese know a holly (Ilex pedunculosa) that they call Tung-ch’ing. Native Americans chewed berries for colic, indigestion. Leaf tea for measles, colds, flu, pneumonia; drops for sore eyes. Externally, for sores, itching. Chewing only 10-12 berries acts as a strong laxative, emetic, and diuretic. Bark tea once used in malaria and epilepsy. The liquid obtained from boiling holly leaves in water can be used to reduce fever. It is also used as a remedy for bronchitis, arthritis, and rheumatism. White holly seems to have been used in the past primarily as a means of cleansing the system by promoting the proper elimination of waste products from the body. Fruits considered mildly poisonous, inducing violent vomiting and are dangerous to small children. Use under medical supervision. Most holly plants are considered to have poisonous fruits to one degree or another. Caution should be taken where children are concerned.